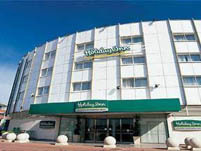 The Holiday Inn London - Heathrow Ariel occupies handy little position just off Junction 3/4 of the M4 on the North Eastern perimeter of the airport. This monster of a chain pretty much have the monopoly on mid-price options in and around the airport. It's relatively modest in size by chain standards with just 175 guest rooms. Each of the rooms are en-suite with tubs and power-showers to keep you fresh and fit for flying. As you'd expect with an American chain, the rooms are spacious and come equipped with well-stocked refreshment trays and satellite TVs with on-demand movies. The onsite Junction Restaurant boasts great views of the airport runways, and serves a classic British menu and large selection of beverages.